Researchers have discovered a pathway by which the brain controls a molecule critical to forming long-term memories and connected with bipolar disorder and schizophrenia. The discovery was made by a team of scientists led by Alexei Morozov, an assistant professor at the Virginia Tech Carilion Research Institute. The mechanism – a protein called Rap1 – controls L-type calcium channels, which participate in the formation of long-term memories. Previous studies have also linked alterations in these ion channels to certain psychiatric disorders. The discovery of the channels’ regulation by Rap1 could help scientists understand the physiological genesis of bipolar disorder and schizophrenia. Previous studies have shown that blocking these ion channels inhibits the formation of long-term memories. Although it was known that L-type calcium channels are activated in response to learning, how they are controlled was a mystery. 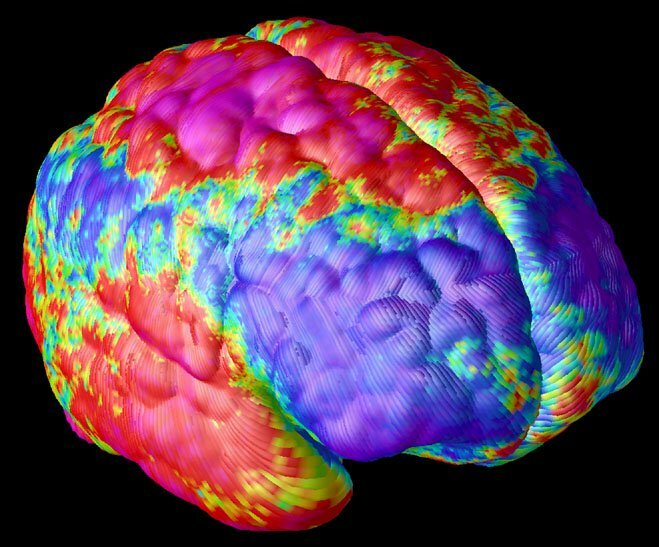 The image shows the Schizophrenia brain and is credited to the NIH. A single neuron in the brain can have thousands of synapses, each of which can grow, strengthen, weaken, and change structurally in response to learning new information. Electric signals traveling from neuron to neuron jump across these synapses through chemical neurotransmitters. The release of these chemicals is caused by the flow of electrically charged atoms through a particular subset of ion channels known as voltage-gated calcium channels. Previous studies have shown that blocking these ion channels inhibits the formation of long-term memories. Although it was known that L-type calcium channels are activated in response to learning, how they are controlled was a mystery. In the experiment, Morozov and colleagues knocked out the gene responsible for coding the enzyme Rap1, which he suspected played a role in activating L-type calcium channels. The researchers then used live imaging techniques to monitor the release of neurotransmitters and electron microscopy to visualize L-type channels at synapses. They discovered that, without Rap1, the L-type calcium channels were more active and more abundant at synapses all the time, increasing the release of neurotransmitters. The results showed that Rap1 is responsible for suppressing L-type calcium channels, allowing them to activate only at the proper moments, possibly during long-term memory formation. The discovery appeared in The Journal of Neuroscience in the study “Rap1 Signaling Prevents L-Type Calcium Channel-Dependent Neurotransmitter Release,” by Jaichandar Subramanian, now a research fellow at the Picower Institute for Learning and Memory at the Massachusetts Institute of Technology; Louis Dye, a staff scientist at the Microscopy and Imaging Core of the National Institute of Child Health and Human Development; and Morozov, who is also an assistant professor in Virginia Tech’s School of Biomedical Engineering and Sciences. Image Source: The Schizophrenia brain image is credited to the NIH and is in the public domain.